Amazon has just announced the development of a new robot assisted delivery service that will get you your purchases in 30 minutes. Check out the video below to see a demonstration of this potential service. The “octocopters” aren’t ready to take flight yet. Amazon CEO Jeff Bezos said in an interview on 60 Minutes. The drones would be ready to take flight in four to five years. 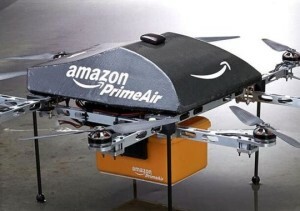 But an Amazon spokesperson pointed to an updated post on the company’s website promising aerial deliveries as soon as federal rules change. Those FAA rules could come as soon as 2015. The type of flights Bezos proposed are currently not allowed. Unlike some other drones currently used, these would be autonomous — they would fly without a pilot. In episode 9 (S2E3) we concluded our first investigation into robots with an interview with Dr. Stephen Granade. Dr, Granade is an expert on robotic helicopters, Listen to the episode to see what he thinks is the future for this type of robot.